Another new brewery here in Wales to spring up in the last year is Tomos a Lilford, based in Llantwit Major in the Vale of Glamorgan. Last year the excellent Grill and Barrel blog did a little piece on them, you can read it here. He's sociable and actually speaks to people unlike myself. I've been able to buy a couple of beers from them, bought in the Elephant and Bun deli in Cowbridge. 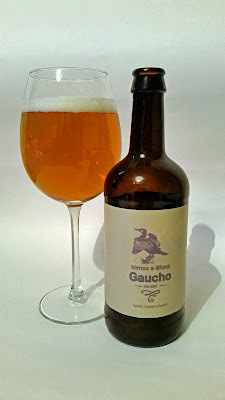 The ones that I was able to get last time was their Rosemary infused beer, and Gaucho a pale ale with Yerba Mate tea. No, me neither! Mate tea is a very popular drink in South America, an infusion of hot but not boiling water, into a gourd containing the dried mate leaves and twigs. You may add sugar, and it contains caffeine. So why would a Welsh brewer be using this? I assume its because of the link between the area of Argentina known as Patagonia and its Welsh history. Onto the beer, a pale ale 5%, 500mls, bottle conditioned. Well conditioned too, its a light gold colour with small head retention. Its aroma is light, some herbal and mineral elements, wet grass. Medium bodied, light across the tongue and crisp, yet some sharpness and again the mineral touch. A nice bitterness throughout, which apparently can be obtained when the Mate is boiled. Overall it was quite enjoyable, I can imagine particularly so on a hot day. The other beer I got was the Rosemary, which is a herb I enjoy, but this beer was so heavily flavoured with it that I struggled to drink it. 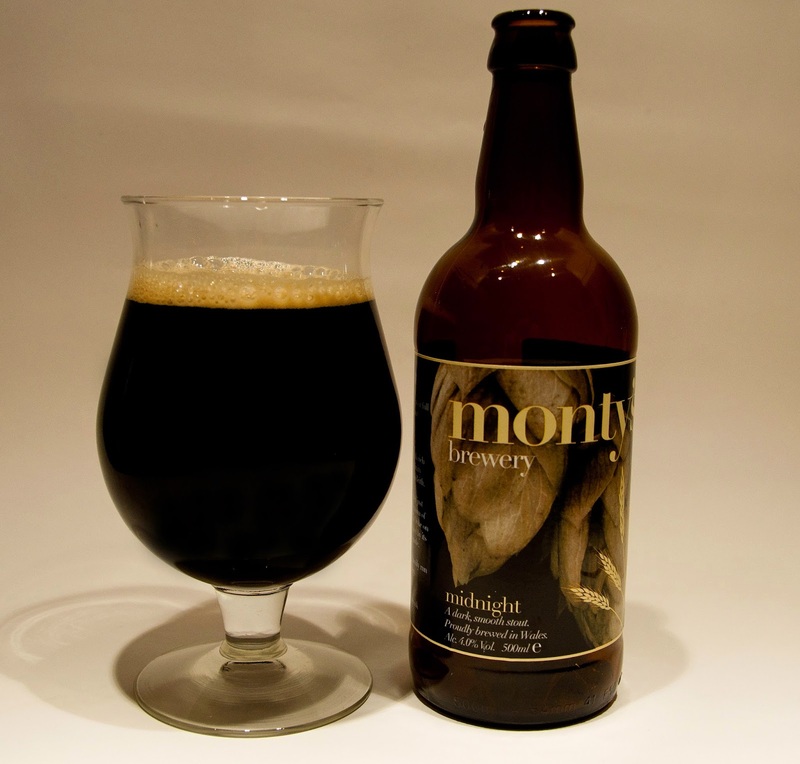 From mid Wales, specifically Montgomery in Powys, is Montys Brewery. I've come across their beers on the odd occasion, but never noticed them being regularly stocked in one particular place. However recently I have seen them in a nearby National Trust property, Dyffryn Gardens and before xmas picked up a bottle of Midnight, their bottle conditioned stout. Its 500mls, 4.1%, and I paid over the odds as you would expect in a NT shop. Now the photo shows a bit of a head but that was induced with some high pouring and soon vanished. 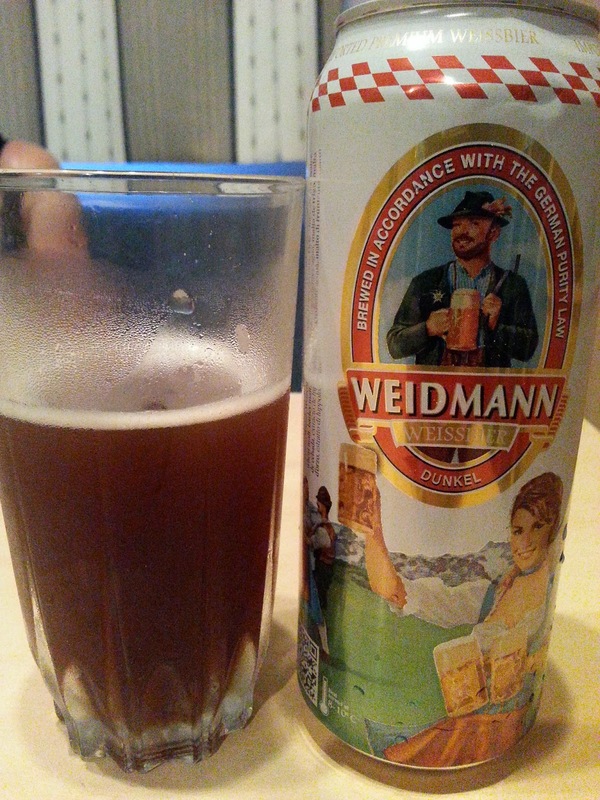 Aroma of malt and coffee, sweet chocolate, and you get the same in the taste, also its earthy, almost ash like. Its got good flavours coming through, its just a shame its let down a little by the conditioning, or lack of, and its body just seems a little to thin. Personally I feel a more bodied stout would wear and present the flavours better, making it more enjoyable. In the Vale of Glamorgan is the town of Cowbridge, previously mentioned here because of the food and drink festival usually held in late October. On the high street has been for many years an excellent deli, which I only learned the name of recently, shame on me, the Elephant and Bun. Amongst the amazing food, they've always stocked some Welsh beers, mostly Otley, but recently have expanded their line up which I learnt from new Cardiff brewers Crafty Devil via their twitter feed. I promptly headed off and see the shelves now includes the aforementioned Devils, Purple Moose, Grey Trees, and Waen Breweries. I picked up two from Waen, the other being 'Alright Treacle? 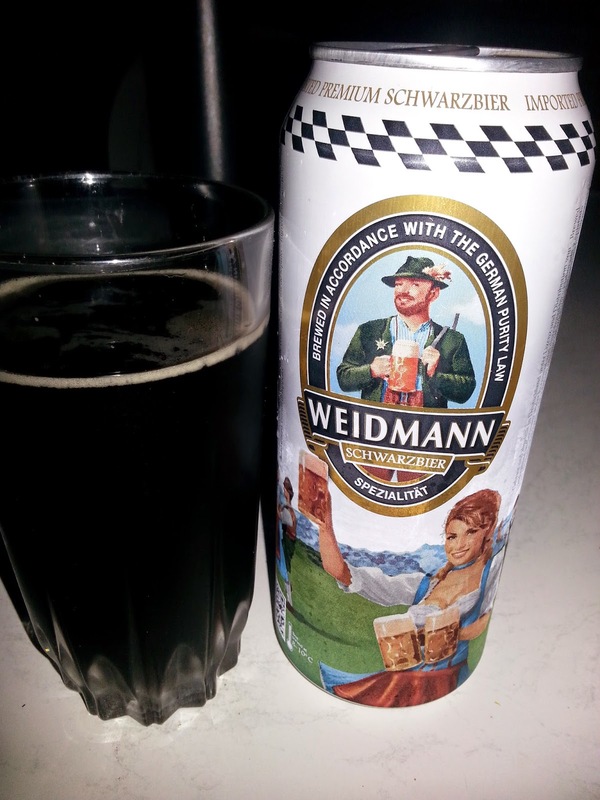 ', a lovely smooth stout, 4.% with a lingering bitterness. A little google search revealed to me that Pamplemousse is the french word for grapefruit, although french slang apparently would have it also refer to women's breasts. 'Pamplemousse' is a pale ale, 4.2%, and was a lively starter. Not surprised at that because it had so much gorgeousness in the bottle that it wanted to get into a glass and be admired. Wonderful tropical aroma from the US and NZ hops used, a hazy gold colour with a frothy head. Great body to it, dry, grassy and a little herbal but mostly your relishing in the juicy tropical fruits, and obviously, grapefruit. A lovely good long dry bitterness follows, leaving you wanting more. I really enjoyed this pale ale, and certainly would get it again when I see it on any shelves or any tap. 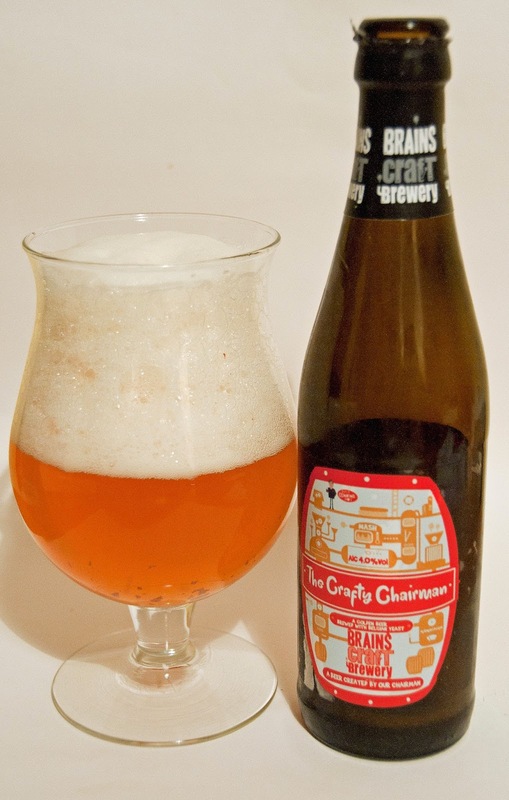 I am sure i read somewhere that Sue at Waen adds grapefruit pith to this brew, which if it's true obviously means it sits in the class of being a 'Juicy Banger'!! 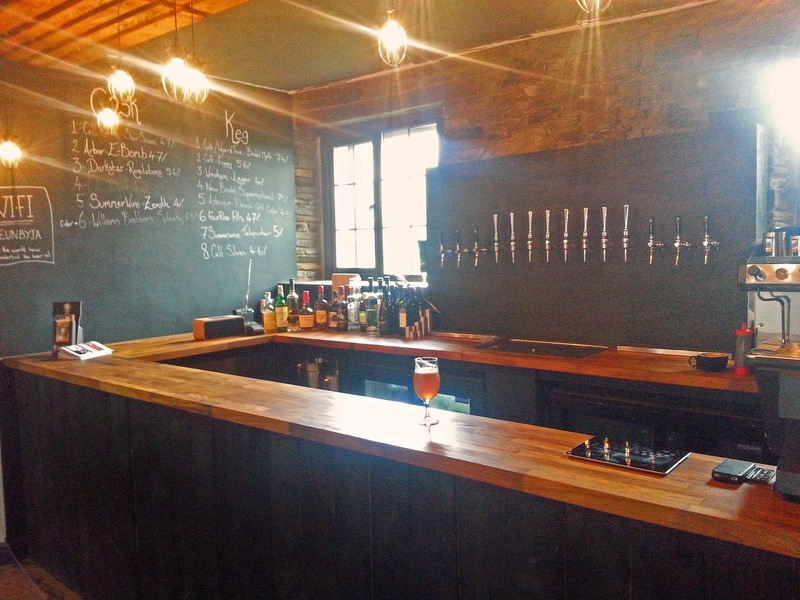 I looked at the (now removed) sidebar on my blog which had a few dozen Welsh breweries listed, with links, and noted it was pretty out of date, a few no longer existed, or changed names since I last updated it. The current number of breweries in Wales is always increasing, so I thought I'd try to give an up to date list as far as I could find. 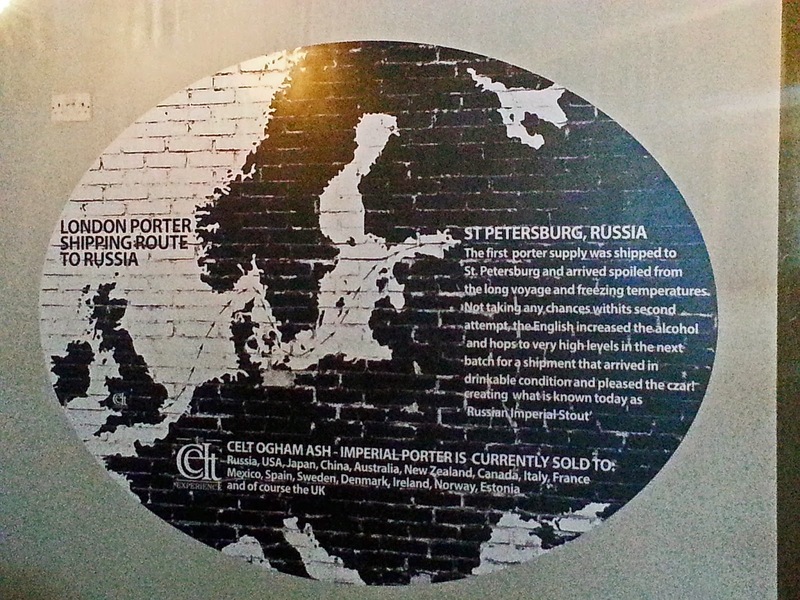 There were quite a few new to me, a fair few micro-breweries in pubs, but I'm sure I've not listed every one. I've listed almost 70 but I'm sure I heard recently there was approx 80 in total. 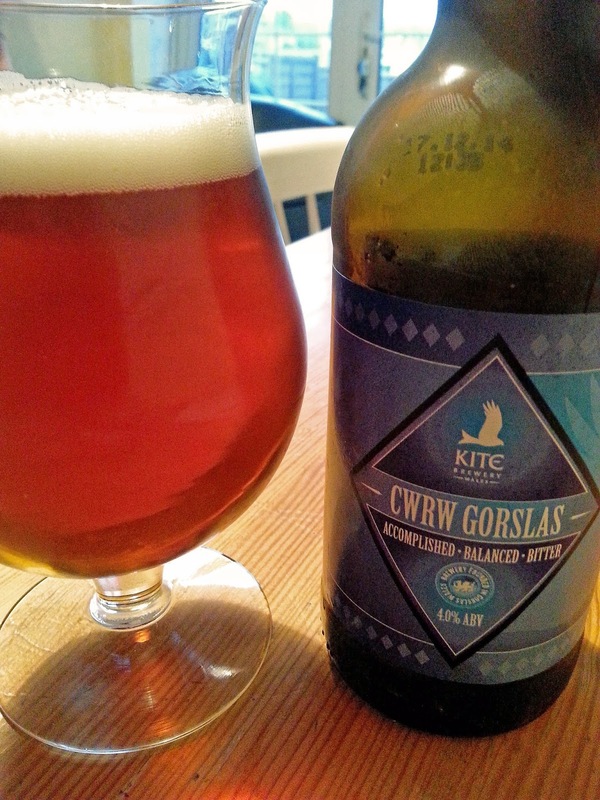 I searched a few sites on line including quaffale, beermad, then crosschecked with other blogs, and used the beer list for the GWBCF for 2014 as it was for the first time an all Wales list. There are a few breweries I have not included, as I've not been able to verify if they are still in production, some seem to have no contact details (web, facebook, twitter). An unscientific method but useful one was to see if anyone is checking their beers in on Untappd or Ratebeer. The links I give with the breweries were ones I found, mostly web, some facebook and twitter. If any details are incorrect or missing please leave a comment below and I'll edit accordingly. If you want me to add a brewery, please provide details, and if you'd prefer for example your twitter account rather then the website I link to, again let me know. I'm going to try to add in additional links anyway but yours will get updated quicker if you help!! I am also going to add another page on the site with all the details on it. Another from the Brains Craft Brewery. This was bought from what has easily become my go-to beer shop, its five minutes from work and one staff member must be now used to having a nurse coming in grumbling to himself about patients and the look of desperation and hunger for beer in his eyes. The Bottle Shop in Penarth is the second opened by the team that started in Roath, Cardiff, (a shop I've looked for on a couple of occasions but never found!). It is situated next to the train station in Penarth town, the shop used to be Arth Wines which had unfortunately ceased trading the year before. They have a great choice of Welsh, British and import beers, and frankly at some extremely reasonable prices, I know a few places in Cardiff where I would be paying more, another reason I've been there back several times. I've picked up plenty from Flying Dog, Beavertown, Left Hand, Brooklyn, Siren, Kuichi, Founders, to mention a few, and the last time I went in they had a record player set up and stacks of vinyl. Choosing beers to The Cure was such a great way to wind down!!! "a vibrant golden beer with a Belgian twist brewed by the Chairman of Brains, John Rhys. Pale Ale, Cara and Wheat malts combine with three British hops – Phoenix, First Gold and East Kent Goldings – and Belgian golden ale yeast"
Originally released last December on cask only, it has now had a very limited edition run in bottles, the Penarth Bottle shop being one of the very few who had a case to sell. Certainly lively, and a Belgian yeasty aroma on the nose, it certainly looked the part. It was however let down by slightly confusing nature, it was to light and thin for a good Belgian beer, as a golden ale the Belgian yeast is distracting, you want something quenching, fresh and hoppy but it isn't quite those things, and your left thinking what am I supposed to be drinking. 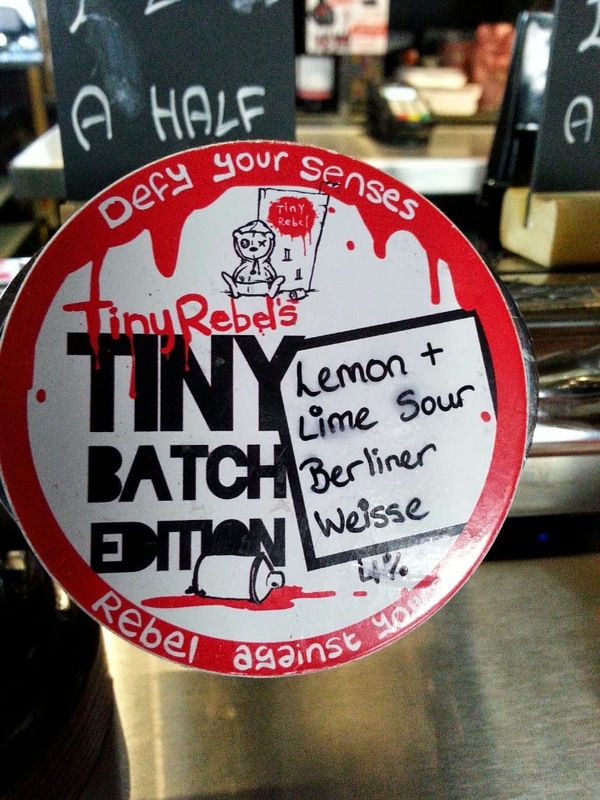 Perhaps it drank better on cask although ratings on Untappd were average too. Well worth a visit, friendly dog, friendly staff, you really should be going to the Penarth Bottle Shop for your beery needs if in that part of South Wales, and being next to the train station means in and out of Cardiff is so easy as well. No excuses! I've been a bit quiet on the blogging front, school holidays, trips away and my wife completing her dissertation which meant a snarl and a sharp word if I even looked at the laptop all contributed to this hiatus. I've had a few Welsh beers which I will review, but to start with I'm going to give a quick recount of our Italian holiday. We were staying just down the Tuscan coast from Pisa. 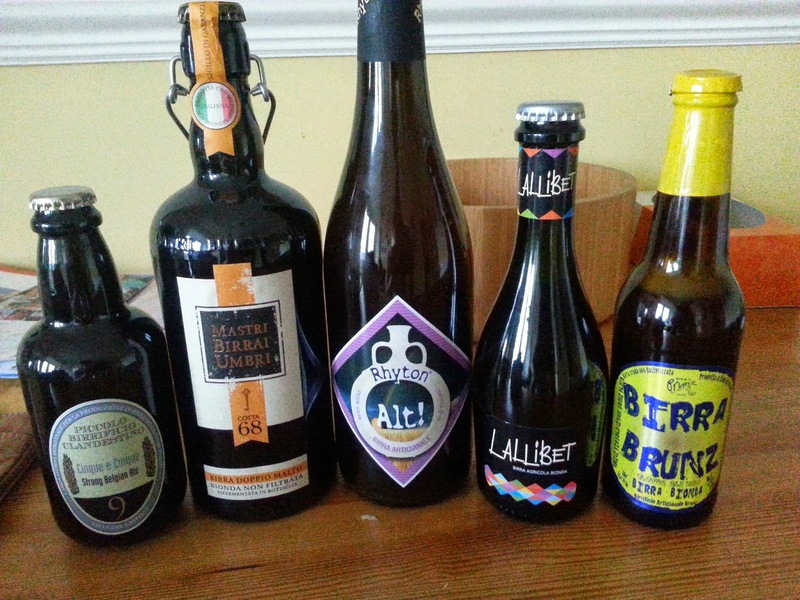 Before leaving I'd joked with my friends that I was hoping to level up my Gondolier badge on Untappd by drinking some great new Italian beers. The truth is instead it was the Das Boot German badge that got the most activity! 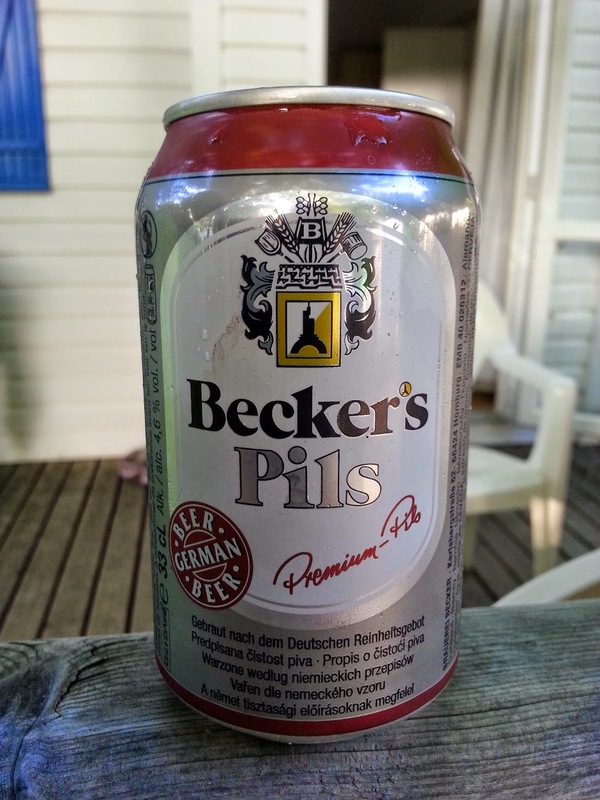 We were Eurocamping, and the local shop whilst having a couple of Italian beers, ones anyone could list of the top of their head, it mostly stocked German beers. I assume this was because a large proportion of the holiday makers were indeed from there, close transportation links too, and luckily their beers are ones I particularly enjoy. On the second day we were directed to a local supermarket, called Penny market, which seemed in layout and contents to be similar to the Aldi/Lidl model. This also was selling predominantly German and Dutch beers, and the more mainstream Italian beers. 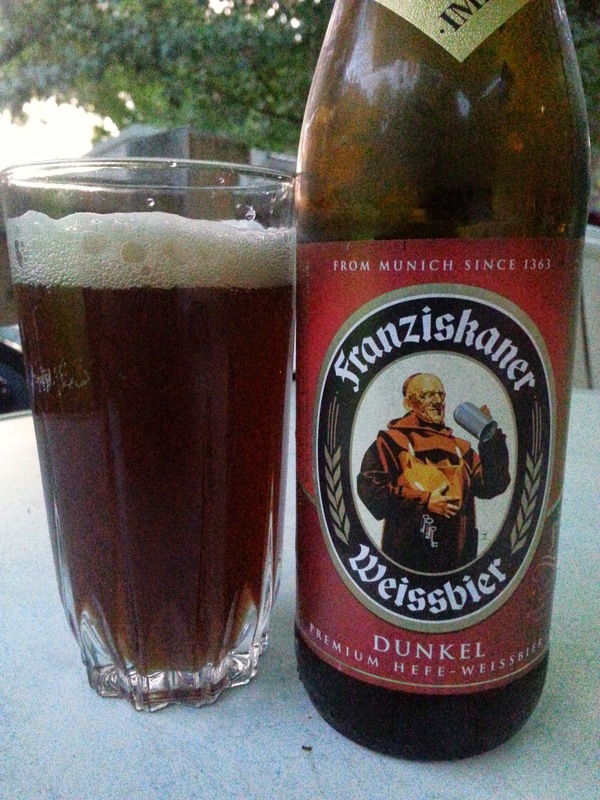 I did however pick up some Kralle brau, Paulaner Munich helles, Franziskaner dunkel. 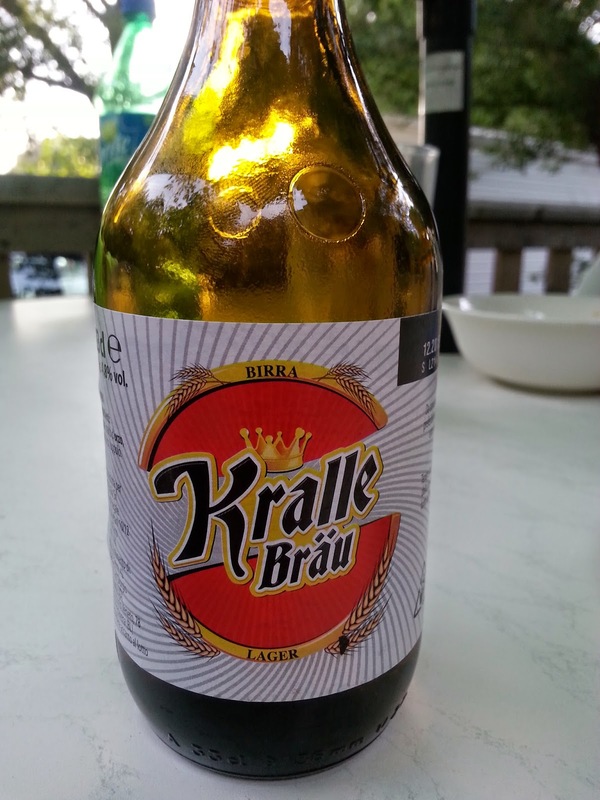 The Kralle although looking like a German labelled beer is actually an Italian lager, not a great one though, a mass produced one in stubbie bottles. 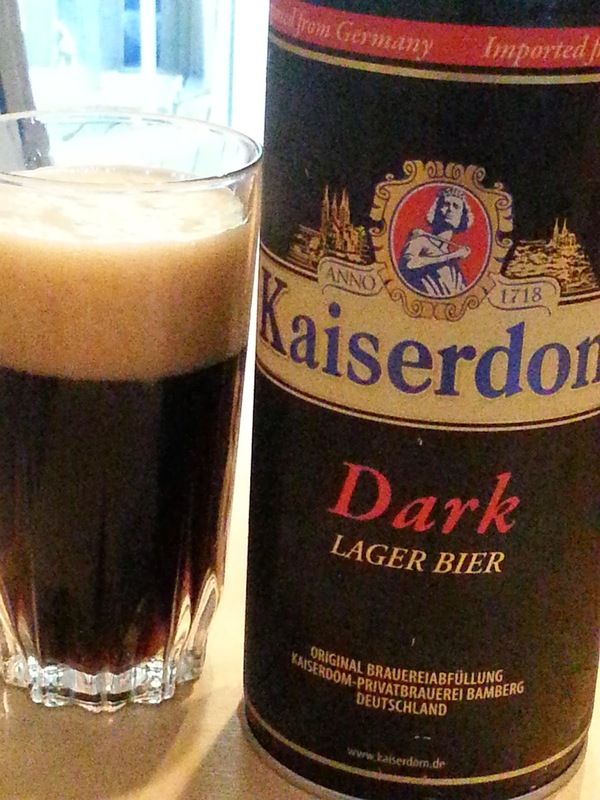 From the site shop I got Kaiserdom unfiltered Kellerbier in bottles and cans, and their Dark lager, and from Weidmann their Schwarzbier and Dunkel. 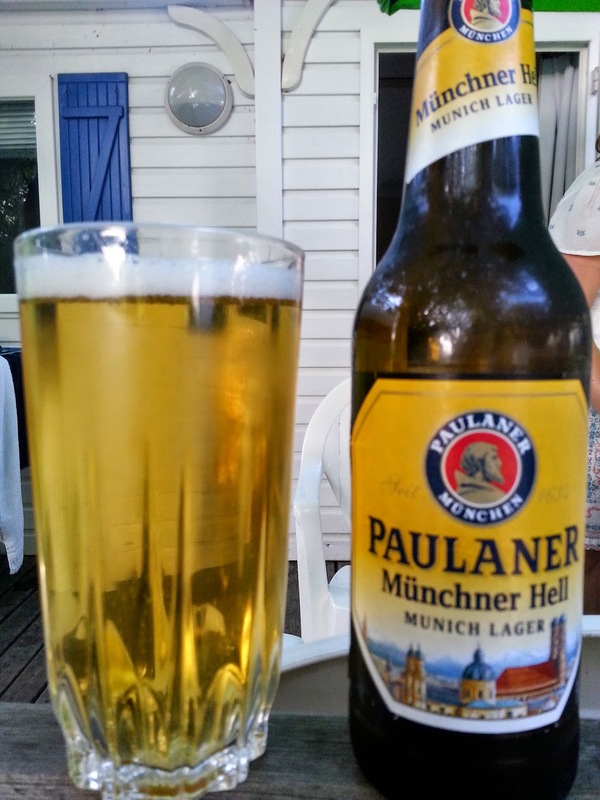 All good beers on hot days, the Paulaner helles was particularly refreshing, and the Kaiserdom dark lager very enjoyable. 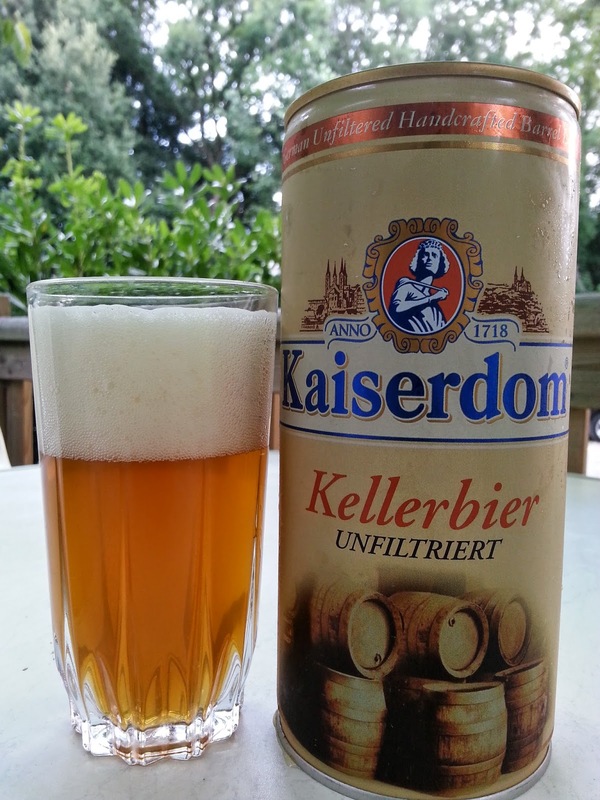 The two Kaiserdom cans were 1litre sizes which I'd not seen before, and only € 3.60. The second supermarket we visited was similar to the first we were told, called co-op, but it was more like a Tesco extra, it was huge. The beer choice obviously was larger but still dominated by imports, slabs of lager, the few 'craft' Italian beers I saw were hugely expensive. On draft I again found choice limiting, although my opportunity to go looking for bars was restricted somewhat. 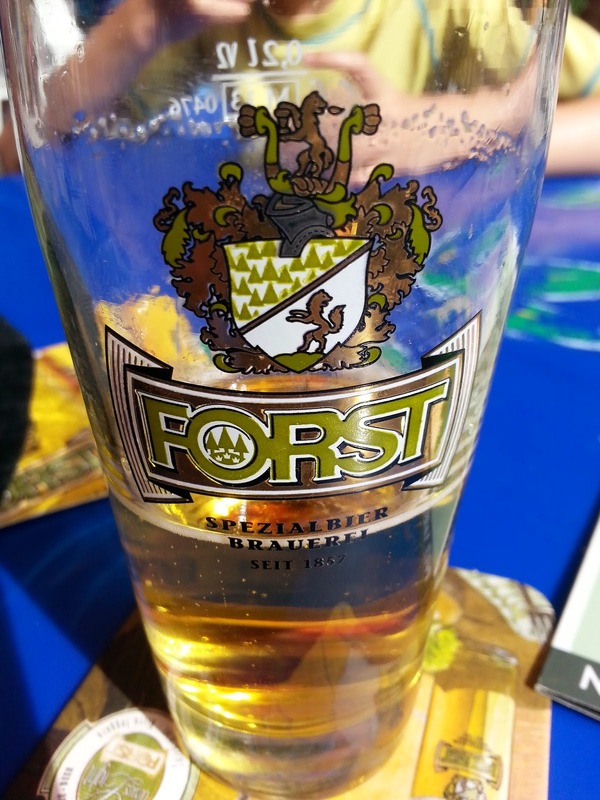 The one Italian draft beer I did try I had varying experiences, Forst, a brewery with a long history and they do produce a variety of beers but unfortunately the only one seemingly available was their Premium pilsner. 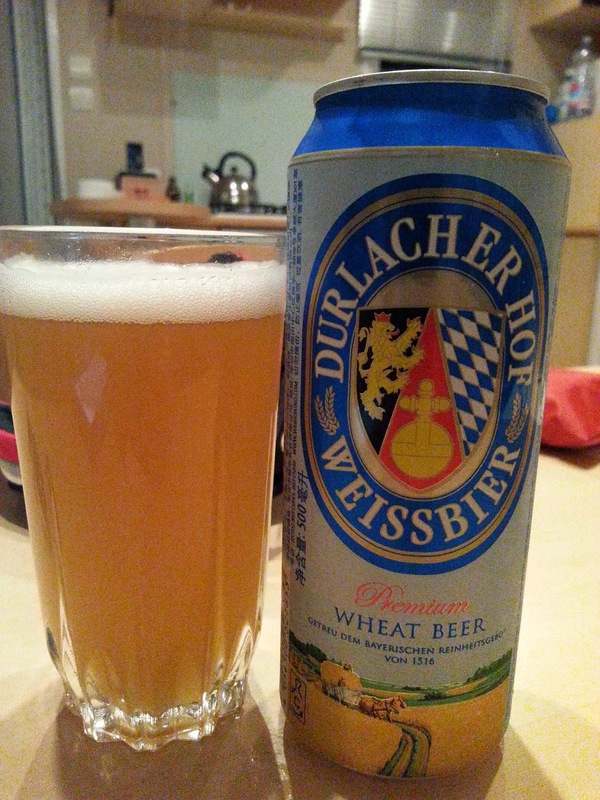 First time it was off, it tasted terrible, the second time was okay, light and crisp if uncomplicated. The third time (for my wife) the beer was being poured when a English woman approached the bar with two glasses and proclaimed 'this beer is off' offering it to the barman who declined to try it. I took mine and tried it and she was right, eggy pint. 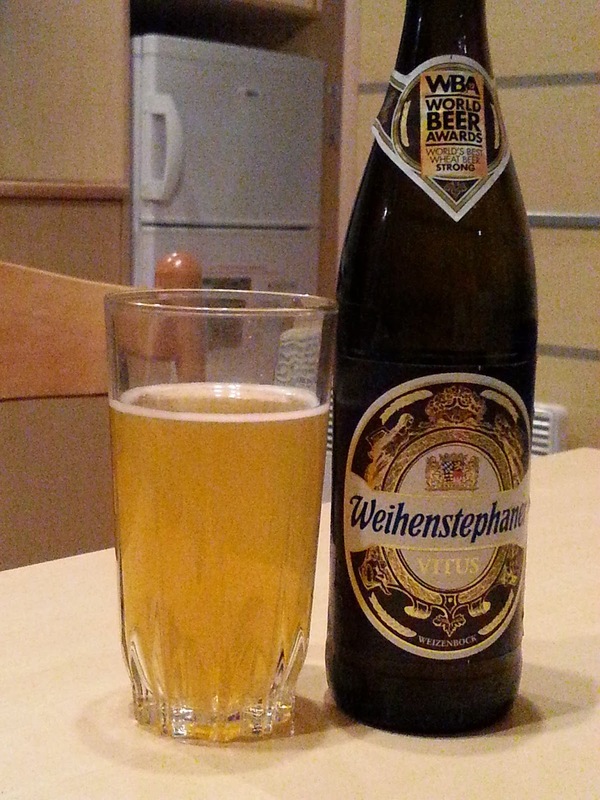 So my wife got a bottled euro lager and I bought a Weihenstephaner Vitus which was fantastic. In my hunt for Italian beer I next went to a shop called Conad which was smaller and quieter than the co-op, but had a great selection of beers and frankly quite a lot at reasonable prices. 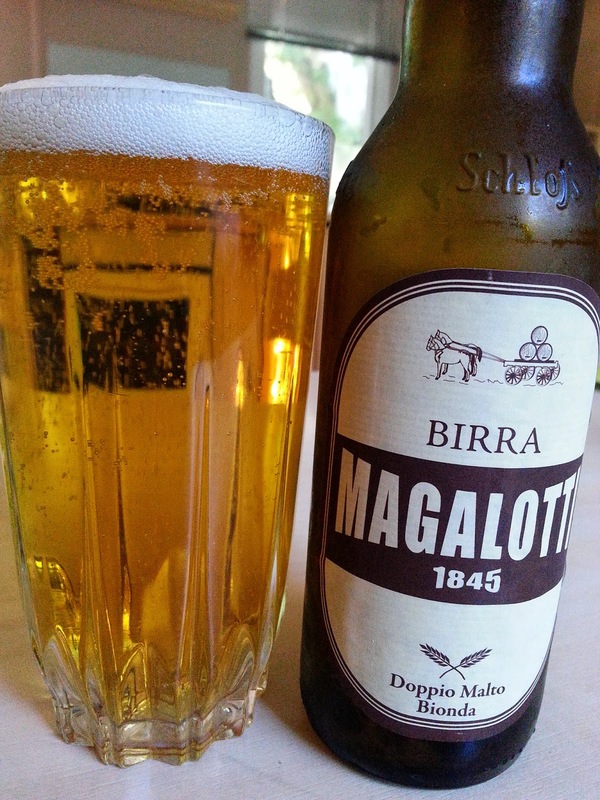 Whilst there I also tried a Birra Magalotti Doppio Malto Bionda, slightly fruity and strong malty taste unsurprisingly. We had a great holiday, and I did enjoy a lot of the beers I drank. And I've a nice few bottles to open at home. I was also directed to a great article via twitter on the Guardian website, if I had the time then there certainly seems some great places to seek out, a family holiday perhaps not the time! If you had the time, and perhaps were in a more metropolitan area then the emerging Italian craft beer scene is well worth checking out, judging by some blog reviews and articles I've read online. 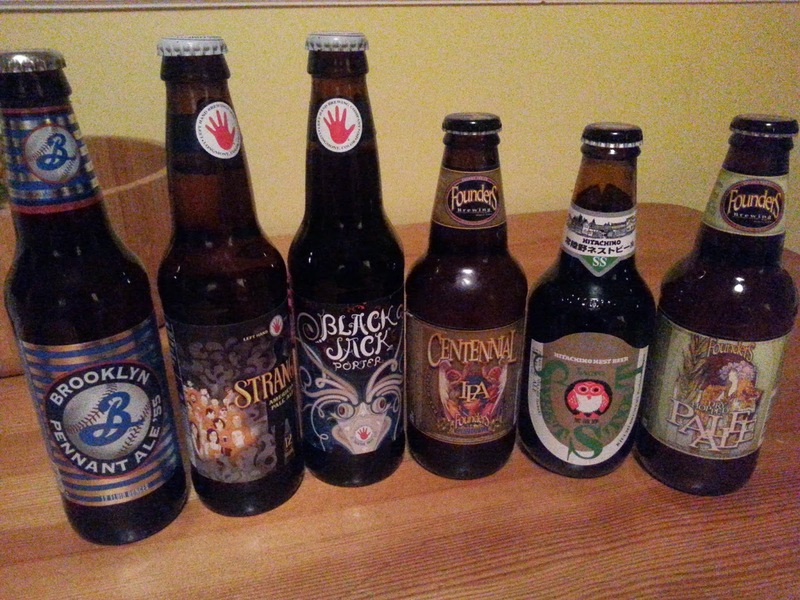 A live blogging post last tonight, tasting a few of the more readily available Golden Ales around on the market. (And then it got too late,and I'm sure you've all been there, the post doesn't happen. So this morning it was finished and photos sorted). Its Pontypridd vs Brecon vs Caephilly. From Pontypridd it's Otley and their 01, the Brecon Brewing co. 'Gold Beacons', and Caerphilly's Celt Experience with 'Golden'. The Otley is 4% abv, with the other two coming in at 4.2%, all 500 ml bottles and all were bought for about £2.30. Of the three the Celt is not bottle conditioned. 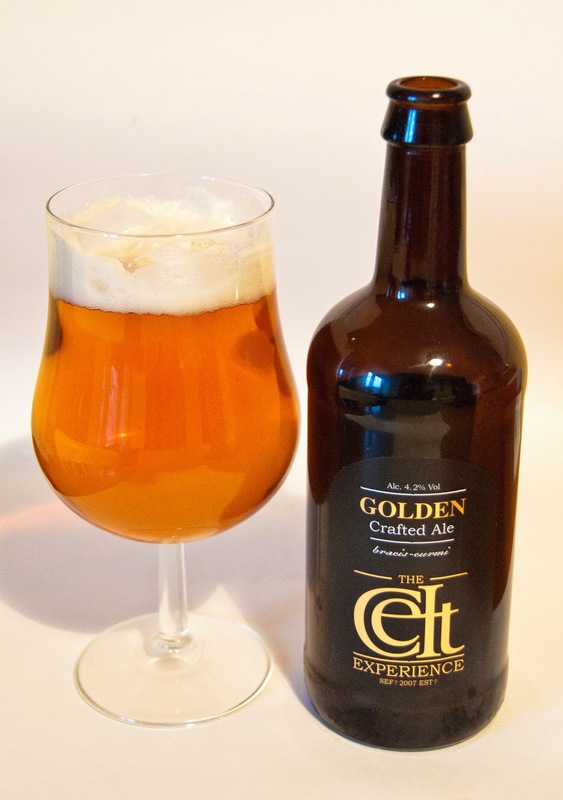 I love the Celt Experience, I've gushed enough about them in these posts before here.They are about to launch a redesign of their labels, this photo shows the current/old design. Billowing head at the start, that settles and gives frothy lacing on the sides. Deep golden orange colour, strong citrus, orange and pine aroma. Great body and this drinks and feels like something so much stronger than 4.2% it must be said. The pine is accompanied by floral bite, and a medicinal/herbal edge too. It reminds me too of my mother-in-laws homemade orange marmalade, juicy but the lingering bitterness that's more grapefruit than orange, a superb quality beer. Enough gushing??!!! After amazing me with their Dark Skies III raspberry and vanilla sea salt infused Saison at the Welsh festival, my wife and I stayed in Brecon not long after and I bought a case of their Gold from the brewery which is based on an industrial estate on the outskirts of the town of Brecon town. 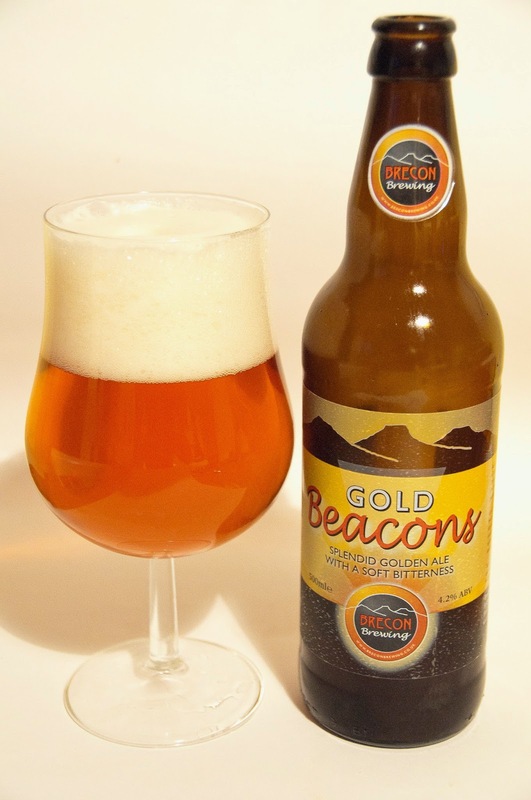 Gold Beacons pours again a golden orange although perhaps a little clearer than the Celt beer. Big pop and smoke on opening, lighter in body than the first beer, a toasty and caramel aroma, with hints of orange and pine. Light and fruity in the mouth, a light bitterness stays with you, its lighter and more refreshing than the Celt. A great beer, and I enjoyed everyone in that case I bought. Otley with their great beers and distinctive branding have firmly established themselves as many peoples favourites, they have three pubs in Pontypridd, the Bunch of Grapes being a must visit if your in the area, great food accompanying their beers. 01 opened with little fanfare shall we say, and scant carbonation. Colour is a much lighter gold than the other two, with little lacing from the head. Now I could tell you that I've had this beer many times, and its dry but fruity, some grass and pine, and quite refreshing. Unfortunately this bottle doesn't seem to hit that description, its got a slight sour aroma and green apple rasp to it, its a duff bottle. A real shame because this is a great beer, usually, as all Otleys beers are. It did start me thinking though about how long it had been on the shelf in my local Spar shop, I don't see a huge turn around on their 'premium/craft' ales. Perhaps its just been there far to long, it wasn't past its date though. I'm grateful that the owner sells the beers he does, Otley, Kite, Brecon and Celt, I wouldn't get these in the village elsewhere, I'd have to travel a little further out, but if they're going past their best sitting there then perhaps I should exercise more caution and watch the shelves from this point of view. Coincidentally whilst editing this post this morning Boak and Bailey posted their weekly round-up which included a detailed piece from the Pete Drinks blog on a very similar thread, worth a read if you already haven't. Under normal circumstances I'd be very happy to drink any of these three beers, the Brecon and Otley are great examples of Golden Ales, and the Celt is excellent too, even if one foot is in the IPA camp with the superb use of hops in it, and if I'm honest I'd choose the Celt over the other two as my favourite. I always eyed people who had ordered a 'cider and black' with suspicion. And this is from someone who only started drinking cider a year ago. The same went for those who put a splash of lime in their lager. Why put blackcurrent into cider? (perhaps its something to do with the fact I dont like blackcurrents). To me its all wrong, just wrong. However fruit in beers really does work, there are so many examples I'm not even going to start listing some. So double standards, yes. 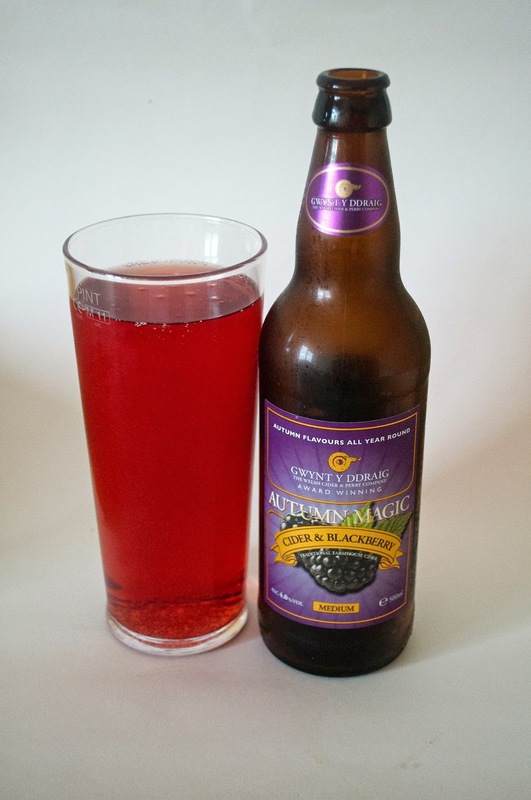 Autumn Magic is a cider from the Welsh cider makers Gwynt Y Ddraig, its a medium 4% cider, light by their standards really, which has blackberries in it. I like blackberries so its ok in my book. (So again my rationale makes no sense). The intial aroma really is full of squashed blackberries, the label mentions apple and blackberry pie, and that first hit is just when your making that pie, washing those berries, the water running red and the aroma of cleaned berries thrown into the pie dish. Its not as sweet or syrupy in the mouth as I thought it would be, a good sharpness comes through on its light crisp body, moderate carbonation. As you get further into it the sharpness seems to dominate more but there is always that dark fruity hit just lingering in there. 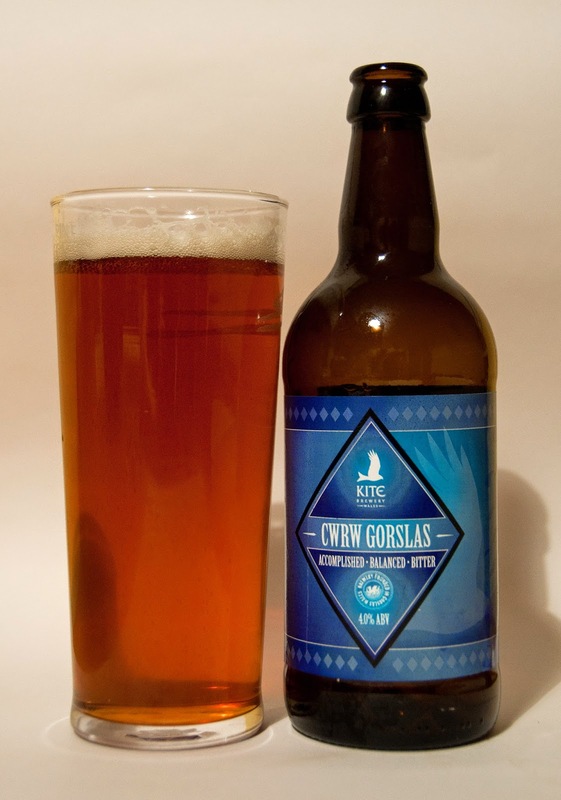 The Kite Brewery have been around since 2011 and were based in Llanelli in West Wales, producing a core range of beers such as Thunderbird and their Welsh Pale Ale, I've seen them at the GWBCF and in the Hope and Anchor in Tenby. In 2013 they decided to relocate and chose a place down the road from me in Talbot Green. Before our trip in May to Cornwall I'd been down to their new site to the brewery shop and bought a case of their Pale Ale which went down very well with my friends and I. Soon after their beers appeared in the local Spar shop, and a local Marstons pub had been recently having them on as guest beers too. Cwrw Gorslas, Cwrw means beer, and Gorslas is a village located in Carmarthenshire near to their previous location. Its a bitter, 4%, amber gold in colour, an aroma of fruit and malts. 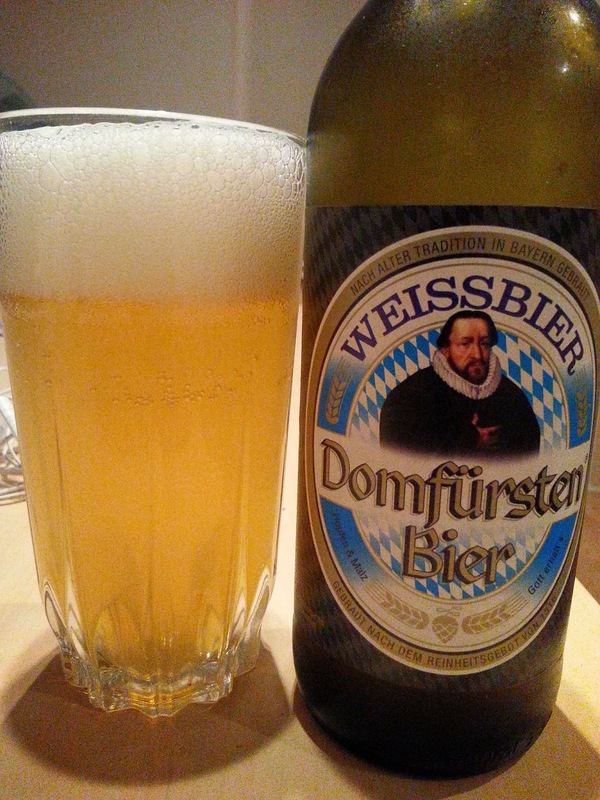 Frothy head at first, good lacing on the glass. Dry, good spicey hops and toffee, with a good body its well balanced and has a nice bitter end. 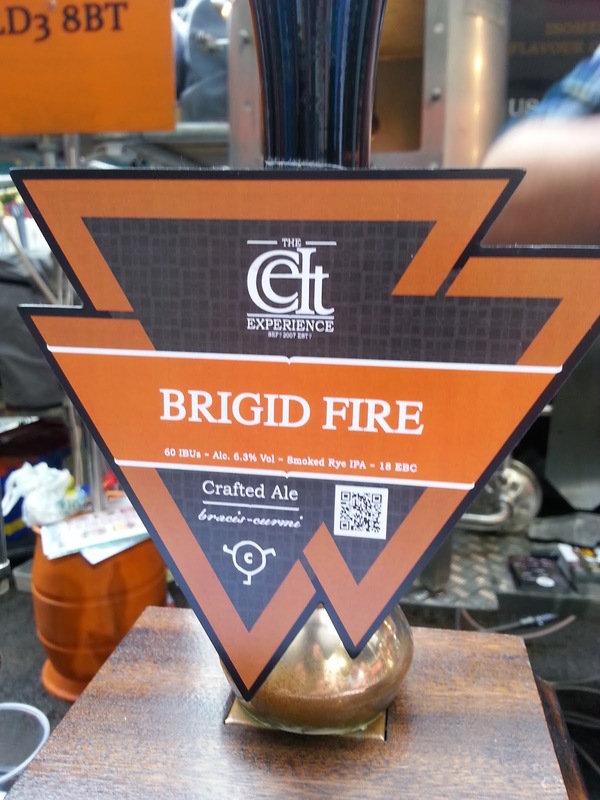 Whilst at the millennium stadium beer festival and standing at the Celt Experience bar buying their excellent Brigid Fire I noticed a few flyers of theirs about the Wheatsheaf rooms. 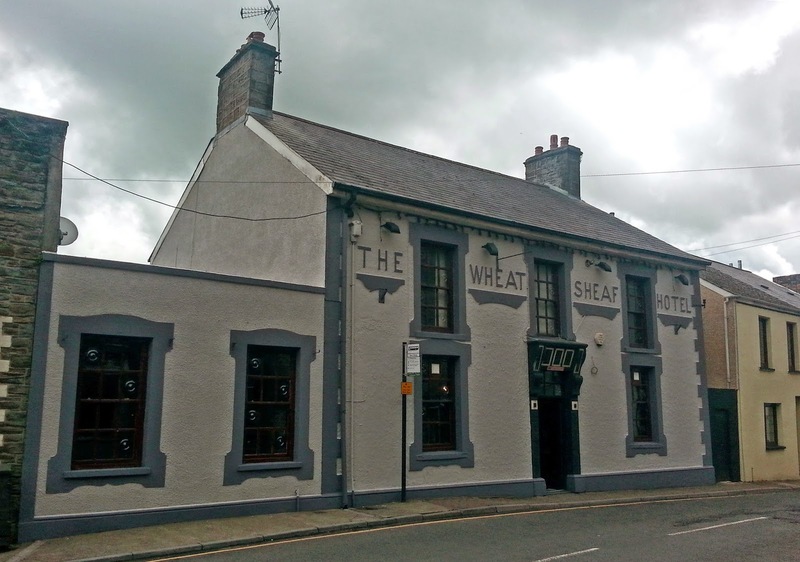 The Wheatsheaf hotel was a pub in Llantrisant, a town at the top of a steep hill in south Wales only a couple of miles away from me, some friends live there to. I had visited it a few years ago when it was a Newman's pub, a Caerphilly based brewery. I'm not totally clear on their history but Celt seems to have been born as a side project/passion and has now superseded Newman's over the last couple of years becoming the main focus/brand, with Tom Newman at the helm. Their focus on quality, always providing excellent beers, and great branding has seen them become one of the leading craft breweries in Wales. I dont think I've had a beer of theirs I didn't like. The pub itself closed about a year ago, in its last working year it also housed it's own brewery which moved on and is now the Pixie Spring/Hopcraft brewery which remains very local also. Last week however saw the reopening of the Wheatsheaf as the Celts brewery tap. I had briefly spoken to Dean at the stadium, the new bar manager, unfortunately due to work commitments I was unable to attend the launch night. building features mixed with modern bar styling. It works well, the rooms could be quite dark but have large windows and subtle lighting. Large wooden bar with taps behind, chalk board with current offerings keg and cask and as you'd expect their range of bottles in the fridge. When I saw this beer on untappd last month I thought what a brilliant name, and so I went for Celts 'Bristol Meth' 7. 4% double IPA. Full of pine, toffee, a smacking bitterness, and hints of lemon, it was the right choice. Dean and I chatted about our thoughts on the recent festival, music and the bar. They're starting to serve food from next week (early July). 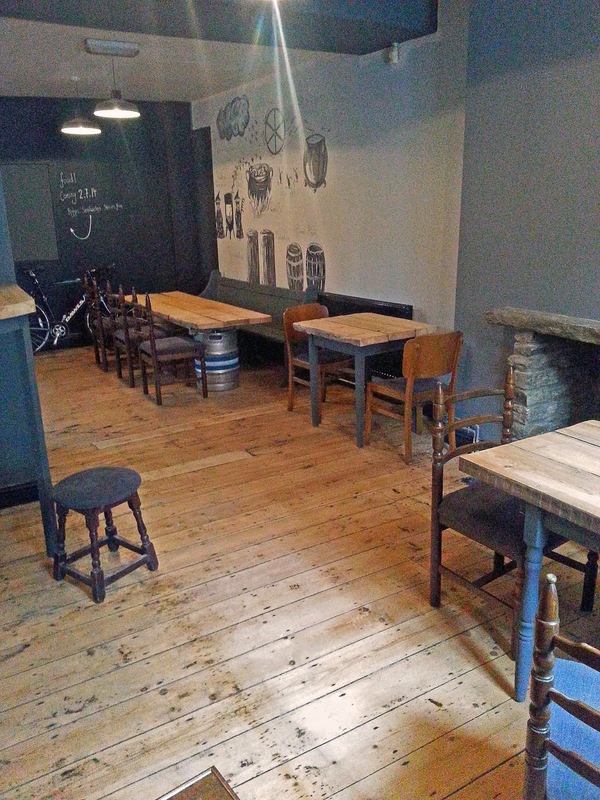 You can found out the latest news and beers on via their Twitter feed @CeltLlantrisant. Hopefully this bar will be a huge sucess, outside of Cardiff I'm struggling to think of other bars that offer the same experience in South Wales, its easily accessible literally only 5 minutes drive of J34 of the M4, and I'll be back there soon too. Thanks to Dean for his time, a top bloke. 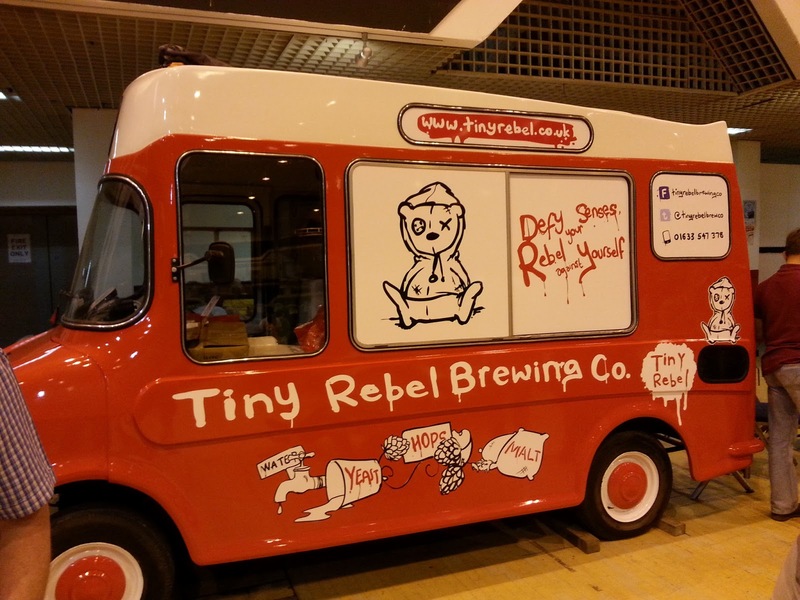 Newport brewers Tiny Rebel make it two years in a row by taking gold again at the Great Welsh Beer and Cider festival in Cardiff this year. Fubar is a 4.4% American Pale ale that is bloody gorgeous, a great choice to be honest. Huge congratulations to Gaz and the team. 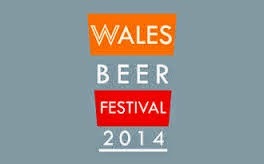 Early June means time for the Great Welsh Beer and Cider Festival, this year its been re branded as the W-Ales Beer festival, in a new location also. Earlier in the year I noticed that the Motor Point arena in Cardiff had a band listed as playing on the dates the festival is normally held there leading me to wonder if it had either moved dates or venue. 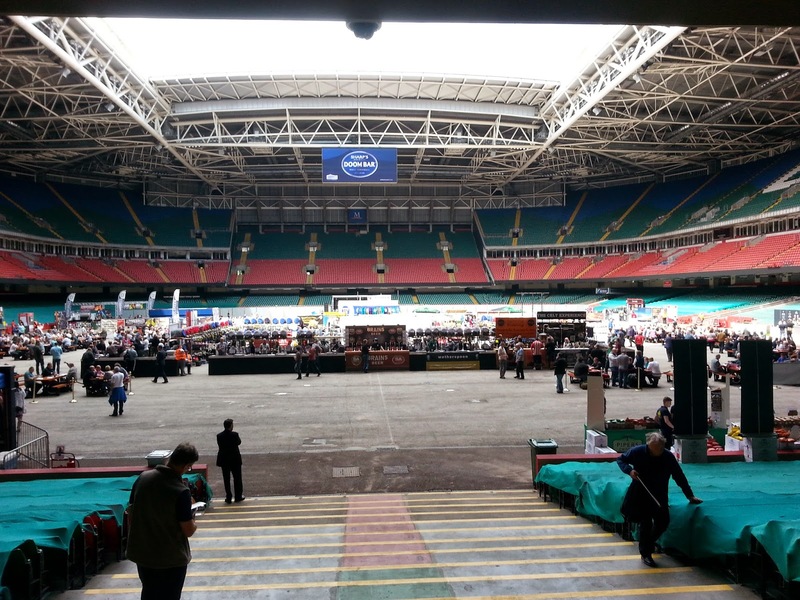 Turns out its the venue as they've upgraded to the Millennium Stadium, and also advertising "an emphasis on international ‘street’ foods" which, lets be honest, can only be an improvement on the dreadful food at the Motor Point. Looking today on the website though I still cannot see any vendors listed so it'll be interesting to see what is there. What looks interesting that they all appear to be Welsh beers, usually there are ones from all over the UK. Price has increased again, day ticket is now £10, other deals available, and you get to keep the commemorative glass if your a CAMRA member. Some great beers are listed, several new breweries to me that I'll try to seek out, it looks like a good beer day for me. 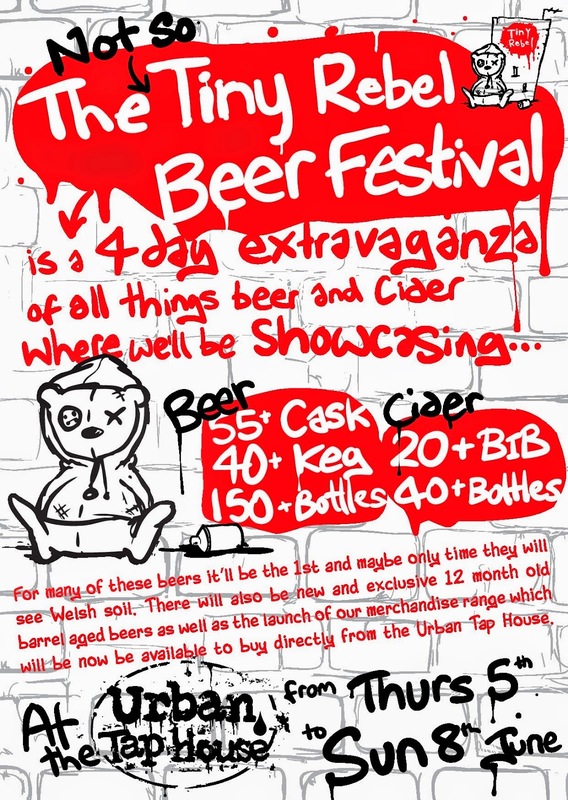 Starting this Thursday until Sunday is the NOT SO Tiny Rebel Beer Festival, at their Cardiff bar The Urban Tap House. You gotta love a spreadsheet and it looks like they needed one here to list the beers schedule so you know when the beers you want will be on tap!! I'm studying Fridays list as that's when I'll be going.